Superconductivity theory was famously expanded from the original Bloch wave pairing to be described as pairing of electrons with time-reversed wavefunctions to enable explanation of superconductivity in amorphous systems where electrons in the normal state have a mean free path of approximately an interatomic spacing. Turning to magnetism, it has long been known that ferromagnetism is robust to disorder, and that amorphous materials support ferromagnetism much as do crystalline systems, including such technologically important properties as magnetic anisotropy. An exception is Fe, where amorphous Fe-based alloys are nearly all frustrated spin glasses, attributed to the mix of ferro- and antiferro-magnetic exchange coupling for different nearest neighbor distances. 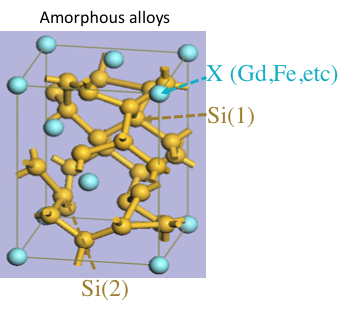 We have discovered a perhaps even more remarkable exception: amorphous Fe-Si and related alloys, where magnetization, anomalous Hall effect, and spin polarization at the Fermi surface are significantly larger than crystalline counterparts. This is generally explainable in terms of local bonding structures, but a remarkable result has emerged: the anomalous Hall conductivity, when suitably normalized by magnetization and number of charge carriers, is independent of the longitudinal conductivity. This result suggests an intrinsic mechanism, which is remarkable because it indicates a local atomic level description of a Berry phase, resulting in an intrinsic AHE in a system that lacks lattice periodicity, consistent with recent theoretical predictions. The large AHE thus likely originates from symmetry breaking and spin hall coupling at a local level (a local Berry phase), which is typically not expected in materials lacking long range order. Frances Hellman is the Dean of Mathematics and Physical Sciences in the College of L&S, which has the top-ranked doctoral programs in the country. (Go Bears!) She did her PhD at Stanford and postdoc at Bell Labs, joined the faculty at UCSD in 1987, moving to Berkeley in 2005. She served as a long term chair of Physics and several national boards including APS and DOE. She has also been active with COSMOS and the SF Exploratorium.